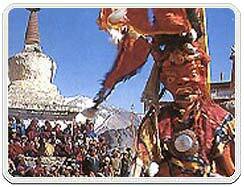 The Hemis festival is a religious fair that is held at the Hemis Gompa located in Ladakh. 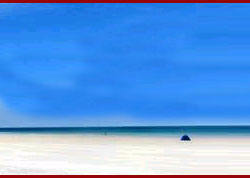 This festival began 12 years back and is marked by masked dances and other festivities. Tours and travel to the Ladakh region gives you a chance to be a part of the Hemis festival that is celebrated at the Hemis Gompa located at a distance of 45 kilometers from Leh, the capital of Ladakh. The Hemis monastery was constructed in the year 1672. This two-day festival is celebrated to mark the birth anniversary celebrations of the Buddhist guru Padmasambhava. This festival is one of the most important Tibetan Buddhist Gompa festivals in Ladakh and is celebrated with a lot of pomp. During this festival the lamas and monks perform sacred mask dances that depict the destroying of evil forces and the celebration of good over evil. Lamas offer contradictory explanations as to the meanings of these dance performances. Special musical instruments that is the three-meter long brass trumpets are played during these dance performances. This festival has a special cultural significance, as this is one time of the year when almost all the families from the nearby villages visit the monastery for this festival. This festival serves as a forum for rural families to socialize. Men wear colorful cummerbands and women wear bright headdresses and lots of jewelry. 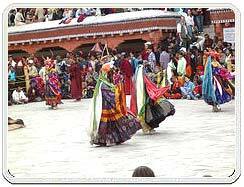 Kashmir Hub offers details about the time and duration of the Hemis festival along with relevant information on tours and travel packages to the Hemis Gompa in Ladakh, Kashmir, India.